Following the shooting at Sandy Hook Elementary School in Connecticut on December 14, in which 28 died including 20 school children aged 6 or 7, there has been a renewed call for more humane gun laws. The early sense was that with such a tragedy, even the National Rifle Association (NRA) would be willing to work with others on measures to reduce the likelihood of this happening again, including measures to regulate access to military-style assault weapons and high capacity gun clips, which have no use other than mass slaughter. Instead, in a press conference on December 21, the NRA came out forcefully against any measures that would limit access to such weapons or indeed any weapons. They instead blamed violent video games and movies for such shootings, and called for armed guards to be posted in every school in the country. I would hasten to add that while the relationship is statistically highly significant, such a simple analysis cannot tell us what the causation is. 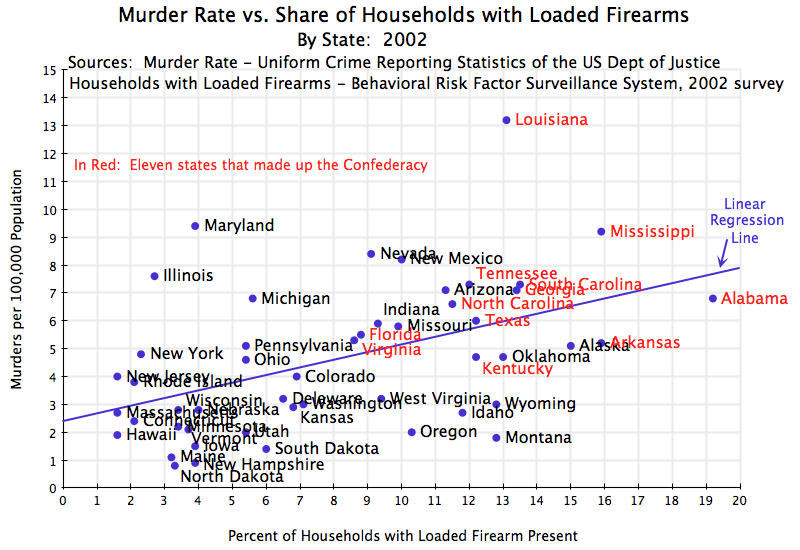 That is, while easy availability of a loaded firearm in the household may be leading to more murders, it is also possible that states with a high murder rate will see a larger share of households keeping a loaded firearm in their home. The extremely simple analysis here cannot discriminate between these two possibilities. Clearly more careful work is needed on such questions, and I am sure there have been efforts at this elsewhere. However, for an issue as important as this, where tragedies such as the Sandy Hook Elementary School shooting recur with disturbing regularity, the availability of such analysis is tragically limited. And a major part of the reason is the lack of good data. The lack of good data is not an accident. You see on the graph above that the relationship shown is for 2002 – ten years ago. The reason is that such state level data on firearm ownership is not readily available. The figures for the graph above came from the Behavioral Risk Factor Surveillance System (BRFSS) survey for 2002 (the firearm results in the 2002 survey are discussed in this article). The BRFSS is an annual survey, organized by the Centers for Disease Control and Prevention (CDC) in Atlanta, and is focussed on health. It addresses issues of health status, health care access, personal behaviors that affect health status (such as exercise and diet), and the use of screenings (e.g. for cancer) and other health services. The survey is a huge one (240,735 randomly selected adults answered the 2002 survey), and needs to be so large to be able to get valid state-level results. The 2002 BRFSS survey had three questions on firearms ownership: whether there was a firearm in the home, whether it was loaded, and whether it was unlocked as well as loaded. The 2001 survey had only one question on firearms (whether there was a firearm in the home), and the 2004 survey had the same three questions as the 2002 survey. No other BRFSS survey, before or since, has had questions on firearms access. The BRFSS questionnaires are available here. Why have the surveys on firearm ownership been so limited, despite the importance of the issue to the health of Americans? The CDC has long sponsored research on the impact on health of factors such as smoking, seat belt use, and until the mid-1990s on the presence of firearms. There were a number of interesting studies, including a widely read one published in 1993 in the New England Journal of Medicine that found that presence of a firearm in a household did not lead to greater protection for the residents, but actually increased the likelihood of an homicide by a factor of 2.7. However, rather than responding to such scientific study by closer examination of the issue by experts, the NRA responded by having its supporters in Congress cut the CDC budget by the amount being spent on such research, and by inserting into its appropriation bills (still to this day) the requirement that “None of the funds made available for injury prevention and control at the Centers for Disease Control and Prevention may be used to advocate or promote gun control.” (See the references here, here, and here.) This would be analogous to the tobacco industry succeeding in blocking government support for research work on the health impacts of smoking. The NRA and its allies in Congress have also deliberately constrained the ability of the Bureau of Alcohol, Tobacco, Firearms and Explosives to control illegal access to firearms through limiting the ATF budget, by formal constraints written by Congress into ATF legislation, and by blocking the approval in the Senate of any nominee for ATF Director. The requirement of Senate approval of nominees to the post was only added recently, under the legislation that moved the ATF to the US Department of Justice from its previous position in the US Treasury. This was part of the package of legislation that followed the 9/11 tragedy (which, among many other changes, created the new US Department of Homeland Security). But since then, Senators have blocked the approval of any nomination of an ATF Director, blocking the nominees of both Bush and Obama. As a result, the ATF has only had an Acting Director since 2006. The legislated constraints on the ATF also include blocking it from releasing anything other than aggregate data to the public. The ATF is not even allowed to computerize its own gun records. Instead, paper files in cardboard boxes have to be used for the gun traces that the ATF is requested to do routinely by local law enforcement whenever a gun is recovered from a crime scene. It is impossible to say how many criminals have gone free as a result. And these legislative initiatives of the NRA to block research, to block assembling data to allow such research, and to hinder the enforcement of existing laws to solve crimes where guns were involved, have continued. An article today in the Washington Post reported on the success of the NRA in inserting language into the Affordable Care Act (ObamaCare) which restricts doctors from asking patients on the ownership, possession, storage, or use of firearms or ammunition, and prohibits the government or anyone else from assembling or maintaining data on this (see pages 766 and 767 of this file of the text of the Affordable Care Act for the exact language). With it impossible to assemble relevant data and with research hindered, the NRA can therefore say with a straight face that conclusive evidence does not exist that shows that controls on access to weapons lead to fewer homicides. And as in the December 21 NRA press conference referred to above, the NRA can claim gun control efforts cannot work, while simultaneously asserting that a cause of the violence is violent video games and movies. At this press conference, the NRA argued that the way to address gun violence such as the tragedy at Sandy Hook Elementary is to post armed guards in all of our schools. With over 130,000 public and private schools (elementary through high school), that would be a lot of guards and loaded guns. Such guards would need to have their weapons always close, with their fingers near the trigger, ready to fire on a moment’s notice on anyone they feel suspicious, before a would be shooter would have a chance to shoot the guard first. And if this is what we need to do for our schools, then presumably the NRA also believes we need guards with loaded weapons at all our movie theaters (Aurora, Colorado, 12 dead), at our shopping malls (Portland, Oregon, 3 dead; Omaha, Nebraska, 9 dead), in every building on all our college campuses (VPI, 33 dead; University of Texas, 17 dead), at any meetings we have with our Congressional representatives (shooting of Congresswoman Gifford, 6 dead), at our community centers (Binghamton, New York, 14 dead), at cafeterias (Killeen, Texas, 23 dead), at fast food restaurants (McDonalds in California, 22 dead), and at other scenes of mass shootings in recent years, including our churches, synagogues, temples, and mosques; at hotels, cafes and restaurants, supermarkets, department stores, post offices, hair salons, Christian prayer rallies, and commuter trains; and at any work location where there may be a disgruntled worker. The only thing we can be certain about with such a plan is that shooting deaths would rise.